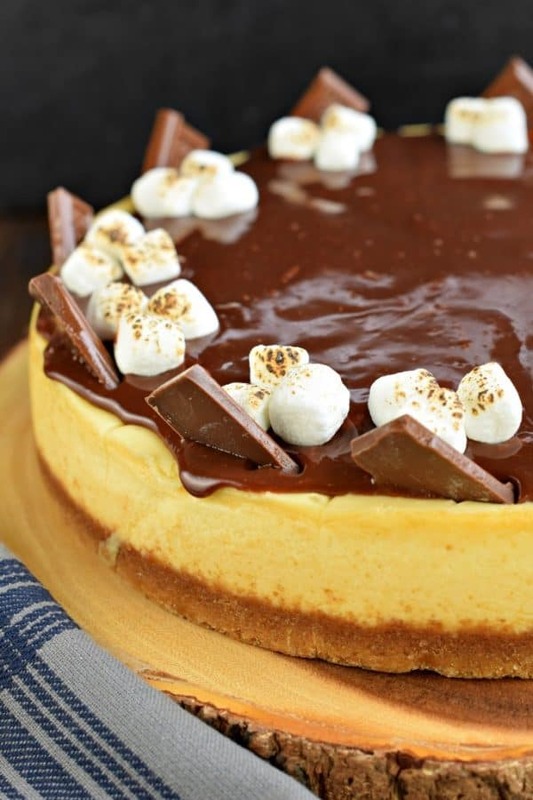 Mouthwatering and perfect, this S’mores Cheesecake recipe is made with marshmallow cream and homemade chocolate ganache. Make the cheesecake ahead of time and top it when you’re ready to enjoy! 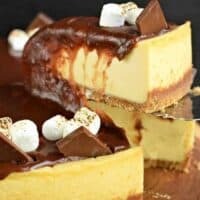 Many years ago I shared some mini S’more Cheesecakes here on Shugary Sweets. They were made in a cupcake tin, and the flavor was spot on! Well, fast forward five years, and I thought it was time to use my Perfect Vanilla Cheesecake recipe and make a homemade S’mores Cheesecake. This was a labor in love, trying to figure out the best way to top it. I knew I wanted to make a homemade ganache, so I first covered the cheesecake with that and some mini marshmallows. I then torched the marshmallows to give them a campfire feel. However, I didn’t like the taste. And, because cheesecake needs to stay refrigerated, the marshmallows got hard and stale. Yuck. So my next trial was to put marshmallow cream between the cheesecake and the ganache. Which was the perfect decision. Although, I have a few tricks on getting it to look amazing! 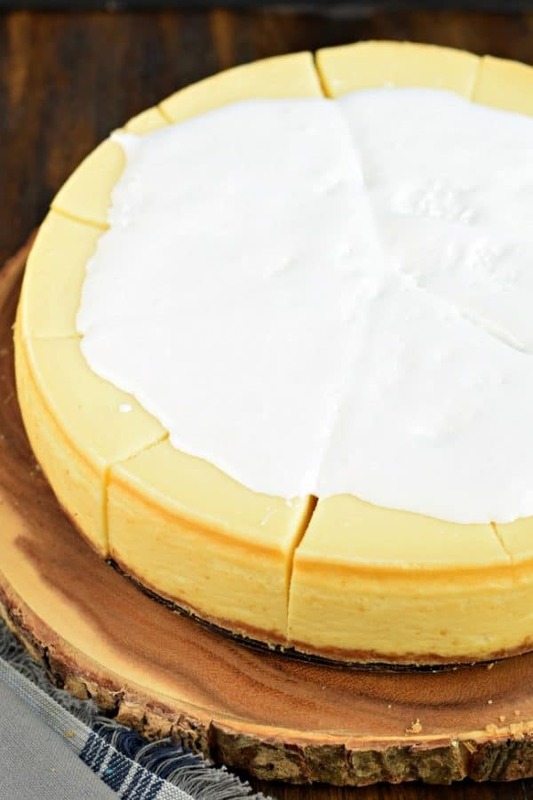 Start by baking up one of my Perfect Vanilla Cheesecakes. To get the perfect slice, I recommend baking the cheesecake in advance and FREEZING it. When you remove it from the freezer, SLICE it while it’s frozen to get PERFECT slivers. Once you’ve baked, and chilled your cheesecake. Cover it with about 1 cup of marshmallow cream. BUT, be careful. Do not spread it all the way to the edges. I spread it to about 1/2 inch from the edge. It tends to “fluff” up once your pour your ganache over the top, and if the marshmallow goes all the way to the edge, it will ooze all the way over the sides. Prepare your ganache according the the recipe and carefully pour it over the top. Make sure NO marshmallow cream is showing. This helps “contain” the marshmallow and limit the chances of it oozing over the edges. 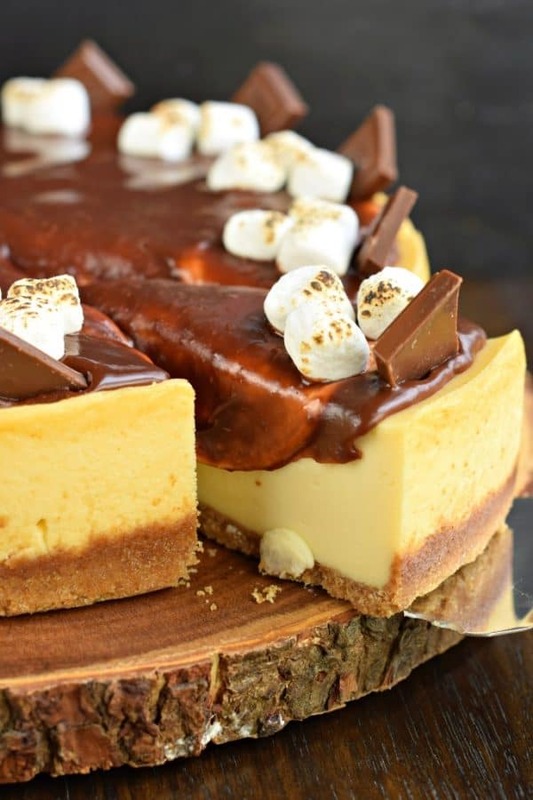 Immediately press in some mini marshmallows and pieces of chocolate bar for your finishing touch. If desired, give the marshmallow a little “toasting” using a Creme Brulee Torch. Keep your cheesecake chilled until ready to serve. ENJOY! I like using a 9-inch springform pan. This works great when making cheesecake cakes too, since my cake pans are 9-inch as well! Creme Brulee Torch. You’ll want this for toasting up those marshmallows! 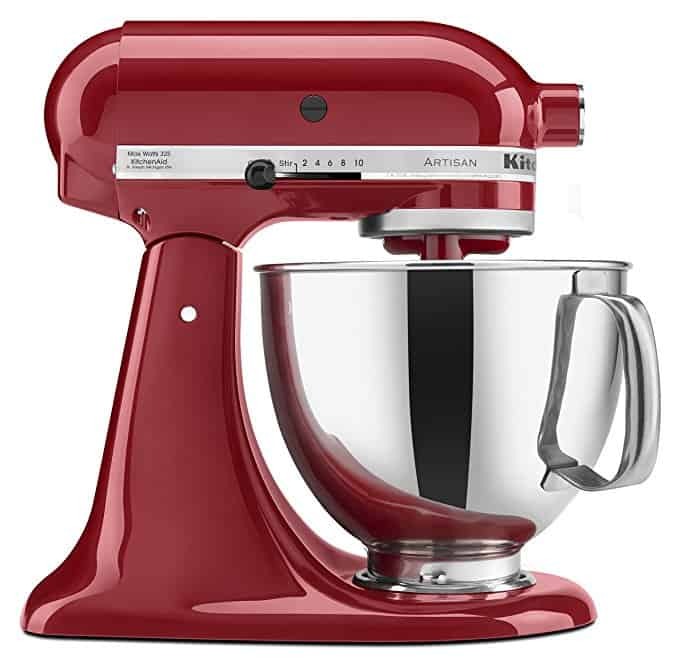 Kitchen Aid Mixer. When it comes to beating cream cheese, I like to set my mixer and walk away while getting other ingredients ready. My kitchen aid is a lifesaver in my kitchen! Have you tried this layered Pistachio Cherry Cheesecake? Not only is it a great holiday treat (red/green) but we love it all year long because it’s so dang good! 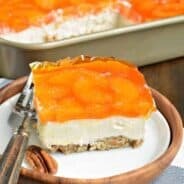 Love no bake cheesecakes? This No Bake Banana Cream Cheesecake recipe is one of our family favorites around here! SO DELICIOUS. In a hurry? Fill a glass with this beautiful NO BAKE Chocolate Chip Cookie Cheesecake Parfait! Layer after layer, it’s a delicious dessert recipe any time of year! Mouthwatering and perfect, this S'mores Cheesecake recipe is made with marshmallow cream and homemade chocolate ganache. Make the cheesecake ahead of time and top it when you're ready to enjoy! 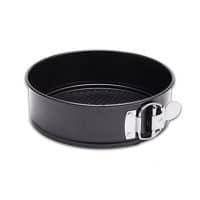 Prepare 9inch springform pan by spraying the inside with non stick baking spray. Set aside. Fill broiler pan with About 1-2 inches of water and place in BOTTOM of oven, on lowest rack. Preheat oven (with broiler pan of water) to 350°F. To make crust, blend graham crackers in food processor until fine. 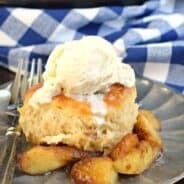 Pour in melted butter and sugar, pulse several times until combined. Press crust into bottom of a 9inch springform pan. Set aside. In a saucepan with inch of boiling water, place a double boiler, metal bowl or glass bowl to heat heavy cream. Once warm, add white chocolate chips and remove from heat. Whisk until chocolate is smooth. Set aside to cool (about 15 minutes). 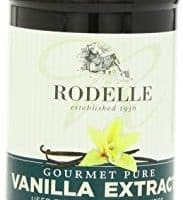 For the filling, beat cream cheese, sugar, cornstarch, sour cream and vanilla extract and vanilla bean paste. Slowly add cooled white chocolate mixture. Finally, add eggs, one at a time until mixture is smooth. Do not over beat. Pour into prepared crust and place cheesecake pan into the middle of the oven. Fill broiler pan with About 1-2 inches of water and place in BOTTOM of oven, on lowest rack. 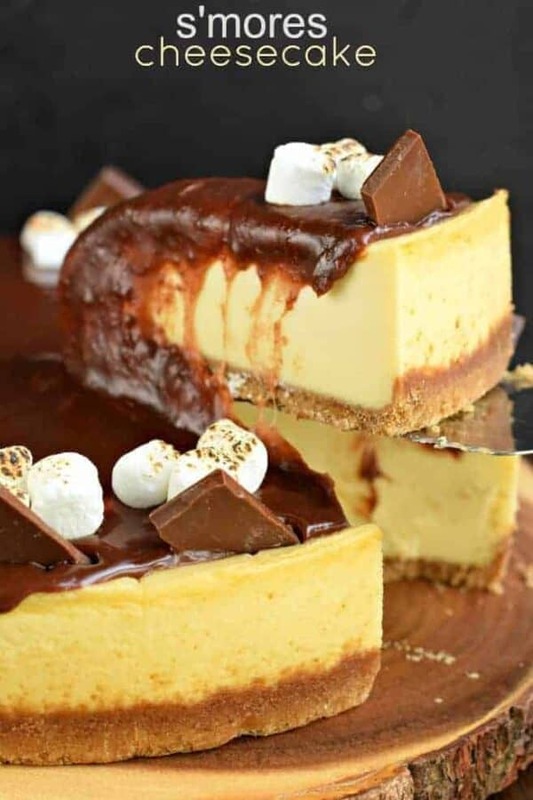 Top cheesecake with marshmallow cream, spreading gently to about 1/2 inch from the edges. For the ganache, add chocolate morsels and heavy whipping cream to glass bowl. Microwave for 45 seconds, remove and whisk until smooth. Slowly pour over the marshmallow, and spread evenly, covering ALL the marshmallow to the edges. Top with mini marshmallows and pieces of candy bar, if desired. Store in refrigerator until ready to enjoy. To make perfect slices of cheesecake, you can make steps 1-6 in advance an freeze the cheesecake. Slice while frozen. Thaw in refrigerator and continue with step 7. I can never have enough s’mores! This looks incredible! 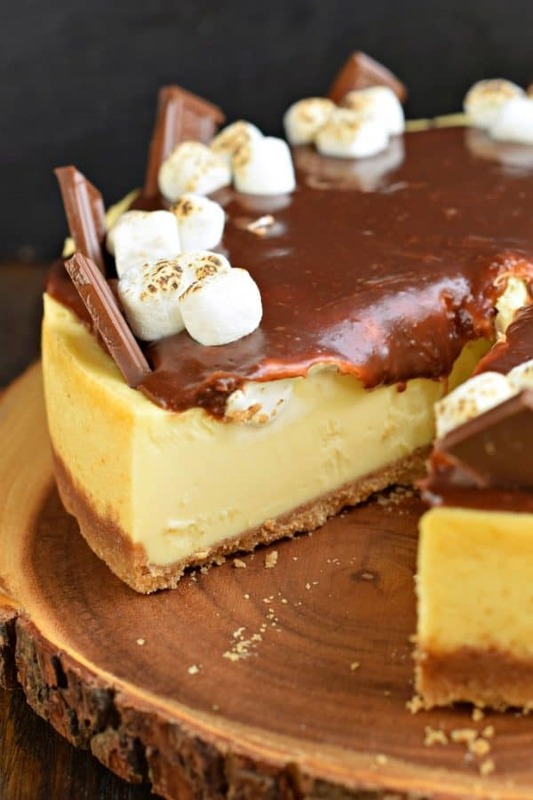 Smores and cheesecake – it sounds too good to be true but it is SO delicious! We love this recipe. This has my mouth watering! You had me at s’mores! My two favorite things in one! Delish! 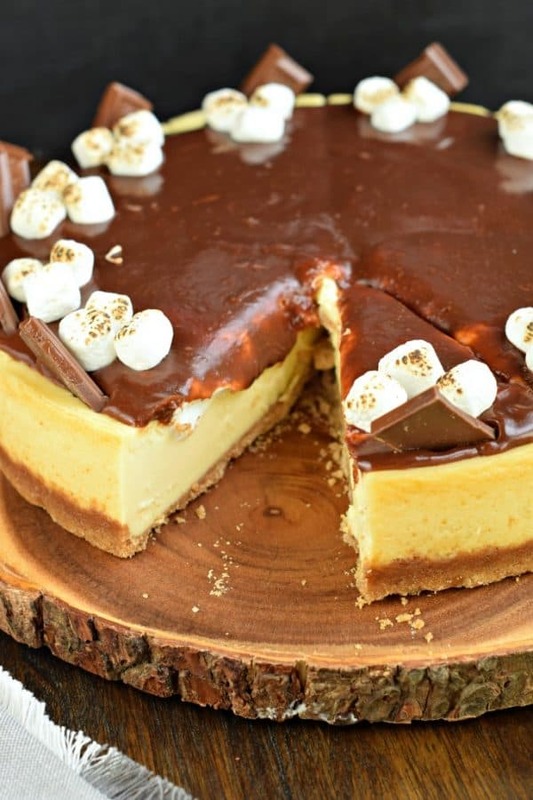 Wow, this looks like the best mashup of two of my dessert favorites! Can’t wait to take my first bite. Can I just say that I’m drooling over here!!! This looks amazing! I need to make it this Thanksgiving. Holy moly! Talk about a rich dessert. 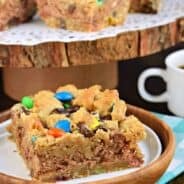 I don’t know how, but you combined my two all time favorite desserts into one!